ORO DEL DESIERTO COUPAGE: An award-winning, specially-crafted blend of Organic Arbequina, Hojiblanca and Picual olives picked between the end of October and beginning of November. The oils are then stored in 2,000 liter deposits where they are analyzed, then selected in varying quantities, and finally blended by the Master Taster to create a superb olive oil with a limited production. The result is a leafy green and golden oil with a bouquet of freshly cut grass, tomato, green olive with hints of citrus and dried fruits. Its taste is well-balanced and medium to smooth in intensity with a pleasant, slightly spicy aftertaste. 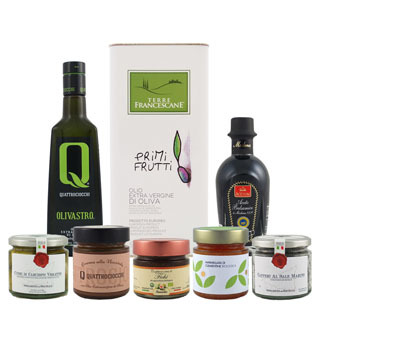 MORELLANA ORGANIC PICUDA: Recently considered the best organic olive oil in the world by World’s Best Olive Oils, this exceptional oil is produced in limited production of only 8,000 units per year. Obtained by the cold-extraction of hand-harvested Picuda olives grown in the Sierras Subbeticas Natural Park in the Cordoba area of Andalusia, the resulting oil is green fruity with medium-robust intensity with hints of apple and green banana and a mature almond finish and pairs well with grilled fish and vegetables and fresh garden salads. OLEOESTEPA ORGANIC: A harmonious blend of organic Hojiblanca and Arbequina olives grown in southern Spain's DOP Estepa (Denomination of Origin), currently one of the most awarded and recognized areas in the world for the quality of it's extra virgin olive oil. This organic extra virgin olive oil has aromas of green olives, artichoke, freshly cut grass, olive leaf and green almond. Its well-balanced flavor and light spicy finish make it ideal for leafy green salads, fresh cheeses and chilled soups. ORO SAN CARLOS ORGANIC: This exceptional extra virgin olive oil is a thoughtful blend of organically-farmed Arbequina and Cornicabra olives grown in Spain’s Extremadura region. This well-balanced oil is medium fruity in intensity with notes of fresh herbs, apple and almond and a subtle spicy finish that especially complements grilled fish, carpaccios, rice dishes and vegetables. Don't know which oil to pick? Stop looking and start enjoying! Select from 3, 6 or 12 month memberships.